As "Rising Star", chosen by the European Concert Hall Organization, the young quartet was invited and debuted at London’s Wigmore Hall, Amsterdam’s Concertgebouw, the Palau de la Música in Barcelona, the Konserthuset in Stockholm, the Palais des Beaux-Arts in Brussels, the Cologne Philharmonie, the Festspielhaus Baden-Baden, the Salzburg Mozarteum, and at Vienna’s Konzerthaus and Musikverein. 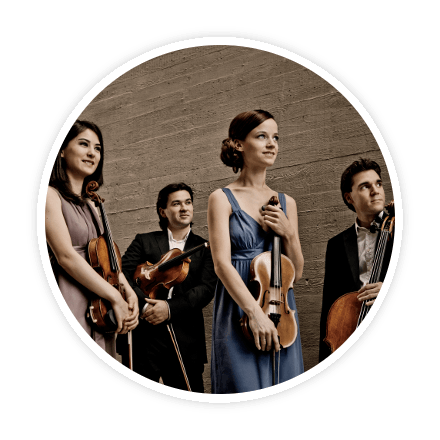 The Minetti Quartett has been a guest at leading chamber music festivals including the Schubertiade Schwarzenberg, Aix-en-Provence, Mecklenburg- Vorpommern and the Kuhmo Festival in Finland. The quartet has already undertaken extensive concert tours to North, Central and South America and to Australia, Japan and China and have collaborated with a number of artists. The Minetti Quartet was founded in 2003 and has since won first prize at the international Rimbotti String Quartet competition in Florence, the Haydn Prize at the International Haydn Competition in Vienna, the top award at the International Schubert Competition in Graz, and the Grosser Gradus ad Parnassum Prize. During the recent seasons, the Minetti Quartett toured extensively in the United States with major appearances in New York City at Trinity Wall Street Church, which was videotaped, for the third time in in Washington DC, and at Shriver Hall in Baltimore. The newest CD with the Beethoven String Quartets op. 18/4, 95 and 18/2 was released in 2014. In 2009 Hänssler CLASSIC released their debut CD with works by Joseph Haydn, followed by the early quartets of Mendelssohn in 2012. Both CDs have received high critical acclaim. The third release in 2013, consisted of clarinet quintets with Matthias Schorn for the Avi Music Label. The most influential teachers and mentors of the quartet members were Johannes Meissl, Hatto Beyerle and the members of the Alban Berg Quartet. In addition they have received valuable artistic stimulus from the Artemis Quartet and members of the European Chamber Music Academy (ECMA), the Amadeus Quartet, the Quatuor Mosaïques and the Hagen Quartet. They have also been active as performers and tutors at the "Sonoro" chamber music festivals in Mexico, Kuhmo and Madrid. The Minetti Quartett thanks the company Thomastik-Infeld for their generous support. "The Minetti Quartett is a musical sensation from Austria"
"as a quartet they were as flawless as desirable in a live performance!" "captivating transparency, drama, accuracy, and with lightness and depth, as the best under the top ensembles can." "The Minetti Quartett puts on an impressive Show"